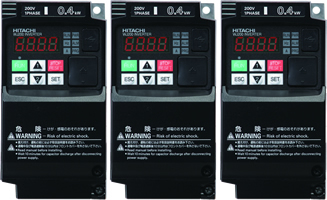 Sequence operation is realized by downloading to an inverter a program created with Hitachi's EzSQ software. User program can be compiled on EzSQ software on a PC. External components can be simplified or eliminated, resulting in cost-savings. EzSQ Example:Energy cost saving by speed reduction. Daytime: Motor speed is automatically reduced to reduce demand during peak hours. Nighttime: Motor speed is increased to take a advantage of off-peak power rates. 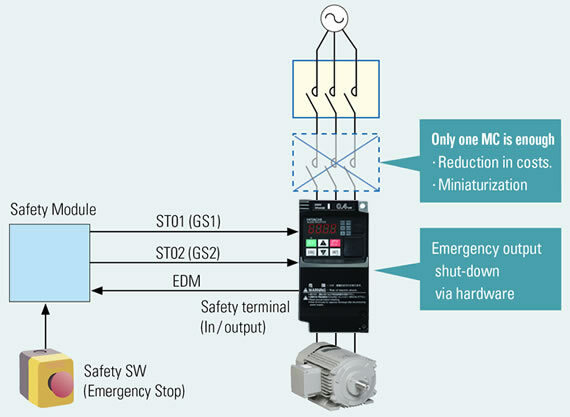 WJ200 conforms to the applicable safety standards and corresponds to Machinery Directive of Europe. Shuts down the inverter by hardware, bypassing the CPU, to achieve reliable safe stop function. The safety standard can be met at a low cost. * 1-phase 100V class is not certified. 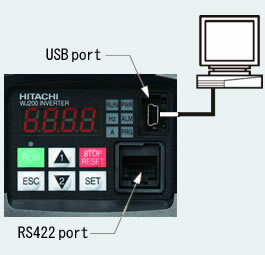 A serial RS-485 Modbus/RTU port is standard. 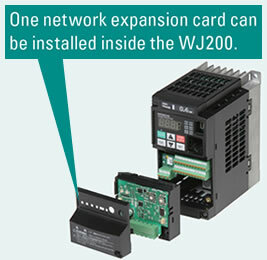 The WJ200 can communicate via DeviceNet, CompoNet, PROFIBUS and CANopen with optional expansion card (planned). USB (Mini-B connector) port and RS-422 (RJ45 connector) port are standard. 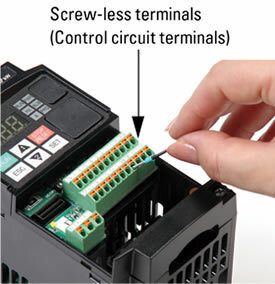 Screw-less terminals (control circuit terminals) spring-loaded, for use with solid or stranded wire with ferrules. 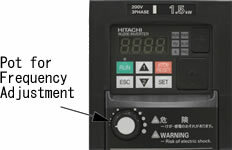 Inverters can be installed with no space between them to save space in the panel. * Ambient temperature 40ºC max., individual mounting. Pot for frequency adjustment is available as option kit. CE, UL, c-UL, RCM approvals. Logic input and output terminal can be configured for sink or source logic. Input voltage 240V for 200V class and 480V for 400V class as standard.